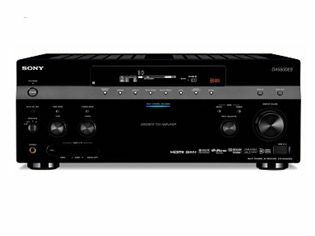 Sony is beefing up its flagship ES (Elevated Standard) range of home cinema products with two new AV receivers. The STR-DA3500ES and STR-DA-5500ES both gain Sony's latest HD Digital Cinema Sound capability, support all the current HD video and audio formats on Blu-ray, and allow multi-zone operation. HD Digital Cinema Sound is Sony speciality, developed with Sony Pictures Entertainment to improve the dynamics of sound reproduction at home. The 7.1-channel STR-DA-5500ES is the swankier of the two receivers, with full DLNA capability to stream audio, video and photos, a built-in internet radio and some handy set-up features. Automatic Phase Matching takes account of typical home cinema speaker configurations, where large speakers may be used for the front left and right channels, but smaller models for the centre and surround channels. The STR-DA5500ES removes any phase anomalies between the speakers, which should improve the surround sound effect. The 5500ES comes with six HDMI inputs (one front-mounted for easy access) and two HDMI outputs. It can upscale and upconvert legacy sources, and has two 'digital media ports' for slotting in your Walkman, Sony Ericsson phone, Bluetooth media player or good old iPhone. The four-HDMI STR-DA3500ES is pretty impressive too, thanks for 7x100W amplification, 1080p upscaling and its ability to deliver sound and vision into a second zone, plus audio into a third. Digital Cinema Auto-Calibration makes it simple to set the receiver up to suit the user's loudspeakers, room and listening position. Both receivers will be available from next month, at prices yet to be released.